If you work with people, or know people, or are a people, then you should read this book. Pentland, A. (2014). 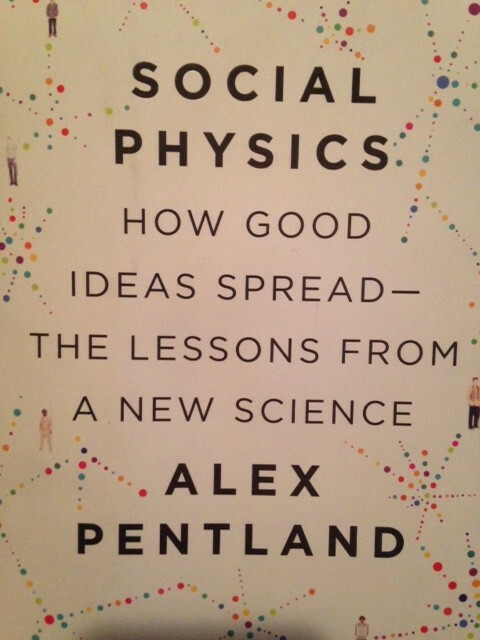 Social physics: How good ideas spread - The lessons from a new science. New York, NY: Penguin Press. For a good overview of what social physics is about, read Pentland's article in the Harvard Business Review. Pentland's work with sensors and big data is revealing quantifiable patterns to human relationships and interactions. He uses enormous data sets gathered from wearable and mobile technology to determine highly predictive correlative, sometimes causal relationships between our social interactions and the efficacy of our work. Further, such data is tremendously useful in guiding the design of organizational structures and processes on the scale of entire cities and nations, that create efficiencies, innovation, and highly effective systems. This chapter also includes a useful list of terms with operational definitions. Pentland draws the distinction between engagement and exploration. Chapter 2 focuses on exploration which he defines as the seeking out and discovery of different ideas from outside one's normal circle of experience. He suggests that social interactions are a critical component of this kind of discovery. It is through such interactions that ideas move from one circle to another. Individuals with wide social networks are likely to be those who introduce new ideas to an organization. Individuals who have many contacts within their own circles, on the other hand, are likely to encounter information feedback loops in which ideas are repeated. It is possible, Pentland suggests that an individual's social network can be shaped intentionally to facilitate idea flow by offering incentives or creating structures that necessitate wider interactions. Chapter 3 describes the flow of ideas and how it can be analyzed to make predictions of an individual's behaviors. By examining one's social networks and behaviors and ideas within the network, it is possible to predict the behaviors and notions of an individual. Connecting with the previous chapter, it is possible for an individual to select the kinds of information and the type of people with whom he engages. The danger again is entering a feedback loop where no new ideas are encountered. The flow of ideas, Pentland suggests, is a critical piece to behavioral and cultural change. Exposure to new ideas is very influential in this regard. He describes how certain kinds of ideas can be propagated through single or repeated exposures; how well the idea is received depends on the source and the environment in which it was received. Chapter 4 is about engagement which Pentland describes as interactions and idea exchange within one's own circle. Engagement is critical for developing trust amongst individuals in an organization, and for facilitating cooperation. He seems to suggest that while diversity and conflict is an essential component of exploration and encountering new ideas, engagement works best when there is unity of purpose and vision. He describes social networks within an organization and the links an individual has with other individuals. Those who have many connections serve as hubs for idea exchange. There may be those in an organization with weak or peripheral connections who are less influential and out of the loop when it comes to idea exchange. He describes how bursts of activity surrounding and innovation are more effective than slow-release or gradual introduction of an idea. He says that engagement builds culture. Exploration on the other hand builds innovation. In chapter 5 the author offers a way of analyzing interactions that is highly predictive of a group's effectiveness. He says that high-performing groups explore a large number of ideas, have many deep and lasting interactions, and explore a variety of ideas within the group. On page 89 he offers diagrams showing the connections between a group with high efficiency and effectiveness and another with low productivity. The highly effective group is characterized by each individual having connections with each of the others as well as regular sustained interactions. The unproductive group is characterized by irregular and uneven interactions between people with some more connected than others. He describes how groups have a collective intelligence that is best leveraged when the individuals are highly connected. He says that face-to-face engagement is critical to productivity and that even social interactions should be encouraged. Informal interactions he says are "often the largest single factor in company productivity." In chapter 6, Pentland offers some suggestions on how to shape organizations. He says that the pattern of idea flow is one factor that is malleable and can be directed when brought to mind. When individuals and organizations are aware of their patterns of interactions, as well as patterns of interaction that lead to highly productive groups, they can make behavioral changes for their own benefit and that of the organization. Leadership should foster close connections amongst all individuals within the organization as well as facilitating explorations for ideas from beyond the organization. Amongst those within the organization, there are patterns of behavior that are more or less beneficial to group productivity. When an individual monopolizes a conversation it can stifle the flow of ideas from others. He developed sensing tools to help reveal and correct such patterns during a meeting. The development of social intelligence, the ability to engage with others, is teachable and desirable within an organization. Such charismatic people engage in many conversations with many people throughout the day and give energy that sustains idea flow. Chapter 7 explores some strategies for motivating organizational change. He describes a system that leverages the influence of one's social circle to motivate certain behaviors. He describes how some reward structures serve to stifle creativity and hinder cooperation. Pentland has measured the efficacy of social reward structures that build on relationships and cooperation across a wide network to great effect. Peer pressure, he suggests, is a tremendous motivator and, in trust relationships, highly effective in promoting cooperation. Chapters 8 through 11 explore applications of social physics for the design of data-driven systems and structures on much larger scales that can inform decision making for cities, nations, and the world. Some interesting thoughts and strategies about how to manage privacy while sharing information that could benefit all of humanity.